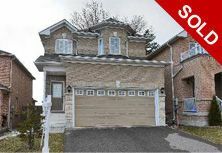 Large Detached Home 3 Bedroom,9Ft Ceilings On Main Floor Modern Family Kitchen And Walkout To Small Deck, Main Floor Laundry And Entry To Garage. Pedestal Sink In Powder Room, Hardwood Staircase, 2 Walk-In Closets In Master Bedroom, R/I Bidet In Master Ensuite, Large Living Room And Dining Room Combined. Fully Fenced Backyard Walk To Go Station, Community Centre And School.